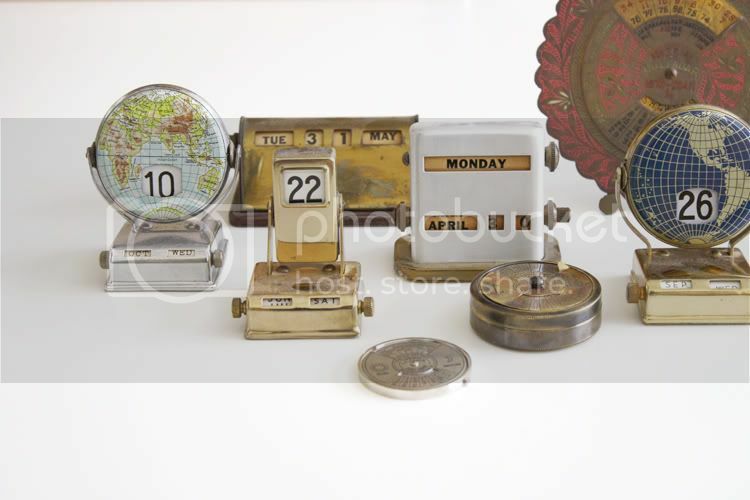 So all this talk about collections, I thought show you a picture of one of the collections I have - perpetual calendars! They're all vintage, they really don't make them like they used to. I don't know when I first started collecting them, I just think they're really fun. Of course, I don't have the right date set of any of them, haha. * Log ride proposal - such a great photo & creative way to pop the question! * Pirate Ship Playhouse - the ultimate kid playhouse, at a pretty ultimate (high) price! * LetterMPress iPad app - in the works, looks pretty cool. * Baby's first grapefruit juice - kids are so funny. * Frolic had a great discussion about crediting photos properly. I can't admit I've always credited photos properly - when I first started my blog I would use a little + plus sign as a credit. That's not crediting at all! heh. I think Chelsea brought up a lot of great points, check it out. * if you're a fan of glee, you must watch GLEE mini-me's - so cute! * if you're local, there's a food truck fest going on in LA this Sunday! So what are you up to this weekend? I think we're heading up north for a quick trip to visit my mom. See you bright & early on Monday, wish you all a most wonderful weekend sweet friends. That pirate ship playhouse is soo cute! Brian does the same thing with me - he'll email me random odd links throughout the day. I love them! The link to your wedding invites on Real Simple is broken. Would love to see them there! I have to disagree with Frolic's post. Although I think she means well, there is no legal or founded reasoning to back her up. Credit is always always important but copywrite laws don't function that way. I could write a whole book about that! Ha! I typically would not care but I have a strong passion about freedom of speech and its legal implications. PS... I do adore that Nick offered his links. That is so sweet and supportive of your blog! @Dancing Branflake - Tiffany, this is why I totally love discussions, because people agree and disagree and it's okay to speak your mind! Really appreciate your opinion, friend! Usually I took photos of them to my blog, but sometimes there is photos from museums too. So cool! The invitation on Real Simple that has a spoon (page 2), was designed by "chewing the cud" but I made the spoons for her. Those calenders are so pretty! what a cool collection! so unique - I really haven't seen anything like it. Haha, I watched the Glee mini-me's, they are adorable! Also the playhouse looks awesome! I wish I'd had that when I was a tot! Haha. Laughed out loud at little baby! Have fun this weekend. It's Mardi Gras here in Louisiana!!! Oh my, this collection is gorgeous! All these talk on collections on the internet is making me itching to start something myself! Are't perpetual calenders so cool. My father had one of those in brass. I wish I had asked him for it. I am sure he would have given it to any of us. Now that he is not around I don't even know where it went. Love those calendars! And I'm so glad to have found your blog! I collect toy cars. Specifically Hot Wheels Hummers. I even rented a Hummer as my limosine for my wedding. Weird I know. I like the vinytage time pieces.